The absolute basics of SEO. There’s an awful lot of nonsense spouted about search engine optimisation, as if it’s a difficult topic. It’s not. Here are the basics of SEO as I see them. Your mileage may vary. A post should be 300-500 words. 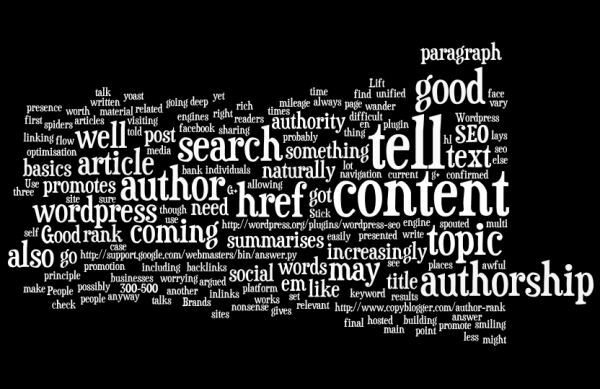 Good content is written for people, but works for search engines too. A good post summarises the topic in the title, and in the first paragraph, talks about in the main text and summarises in the final paragraph. It’s the tell them three times principle – tell them what you’re going to tell them, tell them, tell them what you told them. Use a good platform, like wordpress, which lays the article out well for you. You can use a plugin like wordpress seo from yoast, which will check your text for you and make sure you’ve got the words you need in the right places. WordPress also promotes good site navigation, allowing your readers, and visiting spiders to find all your content easily. Lift relevant content into your current article by deep linking to related articles. This promotes your authority as having a bank of material on your topic. And after that, it’s about the promotion, which is where the social media and social search is increasingly coming in. You need to set up authorship, so that search results have that smiling face in them. Brands/ businesses probably also ought to have a page, (facebook and g+) so that they can have a unified presence, but authorship is about individuals. There’s also something possibly coming in about author rank, which is about authority of that author, but that’s not confirmed yet, so may or may not be worth worrying about. If you’re doing content building and authorship well, author rank should flow naturally out of it. People will tell you it’s all about the backlinks. Once upon a time that might have been the case, though that can be argued. It’s increasingly less so. Good content will promote inlinks and sharing, which will do the same thing anyway. So there you go. The basics of SEO coming down, as always to good content, presented well.